It features a rectangle shape. This undermount sink set is designed to be installed as a undermount undermount sink set. It is constructed with ceramic. This undermount sink set comes with a enamel glaze finish in White color. This transitional undermount sink set product is CUPC certified. It is designed for a 8-in. o.c. faucet. Inside dimensions of 18.5-in. x 11.75-in. and an outside dimension of 20.75-in. x 14.35-in.. Smooth non-porous surface prevents from discoloration and fading. Two - Handle water and temperature control. Standard US plumbing connections. High-quality ceramic cartridge. Double fired and glazed for durability and stain resistance. Drain fits standard sized 1.75-in. sink hole. All mounting hardware and hot/cold waterlines are included. Sink cut-out included in the box. It is highly recommended that you wait for the sink to physically arrive before proceeding with any cutouts. Pop-up drain assembly with overflow. Designed for easy installation. All dimensions are nominal. Features a high quality solid brass construction ensuring durability. Only faucet is CUPC approved. Complies with North American Plumbing Standards. Compliant products are required by city inspectors. Premium white glaze for a glossy finish with a kiln dried ceramic construction. Quality control approved in Canada and re-inspected prior to shipping your order. Complete drain assembly included. It features a round shape. 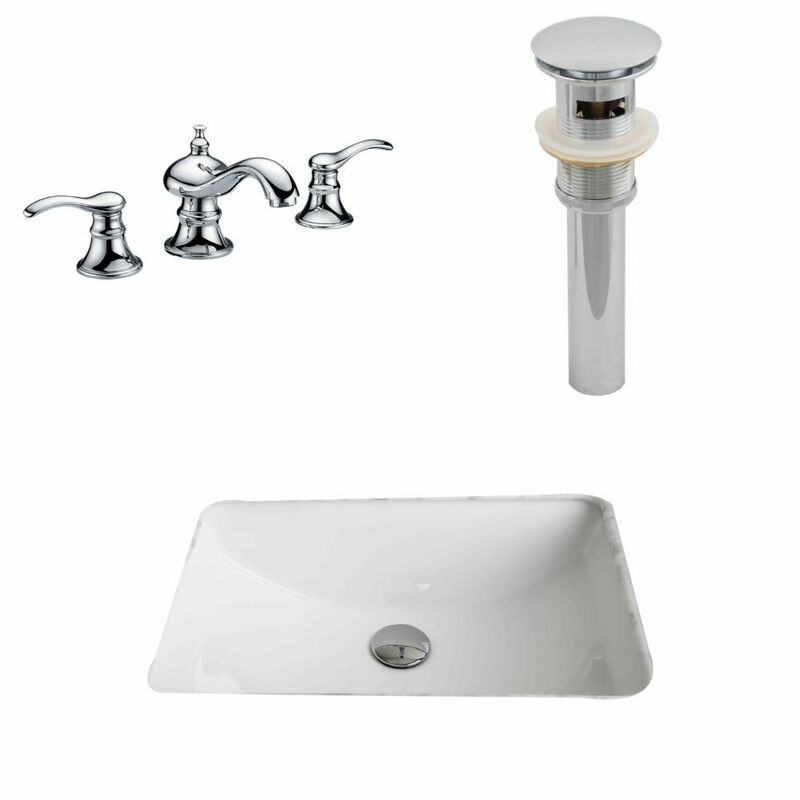 This undermount sink set is designed to be installed as a undermount undermount sink set. It is constructed with ceramic. This undermount sink set comes with a enamel glaze finish in White color. This transitional undermount sink set product is CUPC certified. It is designed for a 8-in. o.c. faucet. 20 3/4-inch W x 14 7/20-inch D Rectangular Sink Set with 8-inch O.C. Faucet and Drain in White It features a rectangle shape. This undermount sink set is designed to be installed as a undermount undermount sink set. It is constructed with ceramic. This undermount sink set comes with a enamel glaze finish in White color. This transitional undermount sink set product is CUPC certified. It is designed for a 8-in. o.c. faucet.